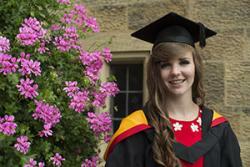 Hard work and dedication has paid off for a Bangor University student who graduates this week. Former Ysgol Emrys ap Iwan student, Hannah Rettie, 21, from Abergele graduated this week with a BSc Psychology degree from one of the UK’s top Psychology schools. In her first year at Bangor, Hannah was awarded an Excellence Scholarship of £3,000. The Bangor University Excellence Scholarship is awarded to new undergraduate students from the UK and EU who achieve the highest academic attainment upon entry in the relevant subject areas. Excited to be graduating, Hannah said: “It feels very scary to be graduating, but exciting at the same time. I’m sad that the best few years of my life are now over, but I’m looking forward to the future. “I came to Bangor because its School of Psychology has an excellent reputation, and I love north Wales – I didn’t want to leave after living here all my life. “During my time at Bangor, I carried on my part-time job I had at home, and I was also employed by the University as an email buddy to advise prospective students and also as a POPPS mentor, which is teaching presentation skills to other students. It was hard work at times trying to balance everything, but it was worth it. “Last summer I participated in an EPS funded internship in the School of Psychology, which gave me first-hand experience of participating in research within a lab. I have also been a course rep throughout my degree, and this year I won the Wise Wales Course Rep of the Year award. “I have been part of Student Volunteering Bangor throughout my three years here, taking part in a number of interesting volunteering projects over the years.